The pastor at the Christmas service today reminded us of the theological implications of saying “Merry Christmas.” Every time that we utter those words, he said, we are telling another person that God loves them, that the true message of Christmas is God Incarnate, God taking on a human form to dwell among us. Earlier this morning I was thinking about what kind of a photo I would post today. I considered selecting a recent wildlife photo, but not of them spoke to me. As I walked the dog while it was still dark, I thought about taking a photo of some of the colorful lights and decorations in my neighborhood, but somehow they didn’t represent Christmas to me at that moment. I finally went out to my front yard and took this modest photo of one of the bushes there. 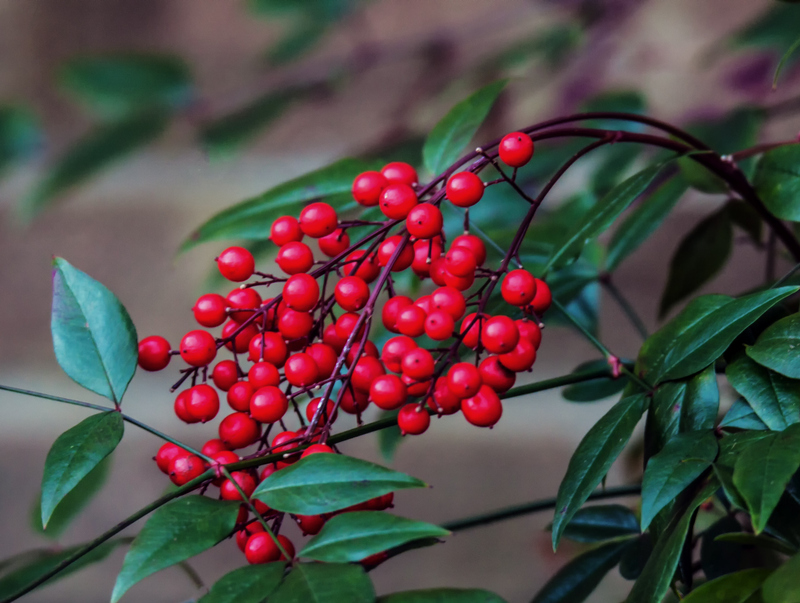 I think it is called Heavenly Bamboo (Nandina domestica) and its simple form and traditional colors seemed an accurate reflection of my inner thoughts and feelings about Christmas this year. Christ came into the world in a humble way and meets us today where we are, no matter what our circumstances may be. With the angel chorus and the heavenly host, I think about these words of the traditional Christmas story that I learned so long ago in the King James version: Glory to God in the highest, and on earth peace, good will toward men. It’s a lovely photo, Mike: a variation on holiday red and green I hadn’t considered. Merry Christmas to you! I hope you had a wonderful Christmas, Mike. There can be no better way to say Merry Christmas than by using one of the smallest of gifts from God that surround us and are so often overlooked. The gifts of your photography are loved and appreciated by Benjamin and I. We wish you a very Merry Christmas! Thank-you, Mr. Mike!! Very Nice Mike! Both the image and narrative!